Sommerfeld. More elaborate 1915 architecture. Dec 7, 1915. Our house in Hesston, Kans. The portch [sic] is South side. This is an exact picture of the house. It couldn't be any more real then [sic] this. This is the south west view of house. -handwritten on back of photograph, underneath labels. 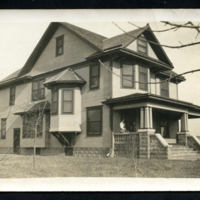 For a time it was used as a men's dormitory at Hesston College, purchased from the John A. Cooprider family and known as "The Elms." -page 39, "Hesston Centennial." 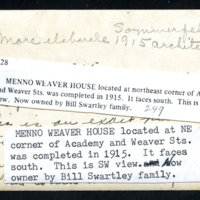 Bandy, Murray C., "Hesston Centennial 1886-1896"
unknown, “Menno Weaver House,” Hesston Public Library, accessed April 19, 2019, https://hesston.digitalsckls.info/item/1671.